The problem is, this isn’t a newspaper. It is chock-full of endorsements, hit-pieces and propaganda, all designed to favor certain candidates. Under Idaho campaign law, such electioneering communication must be declared to the Idaho Secretary of State within 48 hours of the expenses being incurred, and it must list who paid for it. Neither of these laws were followed – no declaration was filed with the Secretary of State’s Office. 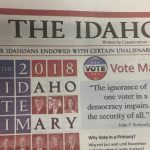 The creators of this “publication” seem to be calling it a newspaper so they can skirt Idaho sunshine laws designed to inform voters about who is trying to sway an election and how. Here in North Idaho, we have become accustomed to such underhanded tactics – the last-minute smear, the flyers that turn up in church parking lots the Sunday before the primary with no attribution. These are the tactics of folks with no respect for you or the law. Chances are, the candidates they’re backing share that same attitude. Don’t be fooled.